One bit of analysis that we end up doing every year on the franchise, when thinking about potential moves and roster construction, is Options analysis. I’m posting this now b/c a couple of the guys w/o options are tender candidates, so this may play into the team’s decision on whether to keep them for 2016. I’ve done this analysis before: here was 2015’s analysis (where 4 of the 6 out of options guys were gone before opening day) and here was 2014’s analysis noting that Corey Brown and especially Ross Detwiler were going to be problematic; Brown was DFA’d and traded shortly there after while Detwiler stuck around for a whole season prior to getting moved to Texas. Here’s the current Nats 40-man roster with updated Service times for 2015 as well as a review of Option Status for the 2016 year. There are a couple guys who seem to have some options limitations going into 2016 that we’ll have to keep an eye on. Storen, Drew 5.140 May 2010 2013 option cancelled when recalled before 20 days were up. Strasburg, Stephen 5.118 Aug 2009 Probably eligible for a 4th based on lack of service time. Four players achieved the all-important 5th service year in 2015: Stammen, Storen, Strasburg and Ramos. It wasn’t exactly likely that any of these four were in jeopardy of getting optioned (all four still had options available), but now they definitely cannot be sent down (as Storen was briefly in 2013). Two guys achieved the “Ten and Five” rights in 2015: Werth and Zimmerman. 10&5 gives automatic trade protection to the player … but both Werth and Zimmerman have full no-trade clauses anyway, so the 10&5 doesn’t mean much. Harper, Bryce 3.159 Aug 2010 2011, 2012 1 Did 2010 count as an option year? In my mind, none of these guys are really candidates to get optioned in 2016 despite having options available to them. Roark was optioned in late 2015 (August 25th) but then got called right back up on Sept 4th, so (if i’m reading the rules correctly) that option was “cancelled” for being too short. I have an open question about Harper‘s 2010 option status; does it count as an option year if you sign a major league contract and then get assigned to a minor league team in the same year? Not that it really matters for Harper (it isn’t like the reigning NL MVP is in danger of getting optioned), and it can no longer happen (MLB contracts were banned in the latest CBA), but its an intellectual issue. If you have an opinion or insight, please feel free to chime in. I’m guessing the rules at the time stated that you cannot burn an option the same year you signed, so i’ve not included it as an option year for Harper here. Turner, Trea 0.045 Aug 2015 3 still pissed he was called up so early. If the season started tomorrow, I’d likely project all five of these guys to be on the 25-man roster, three of them in pretty prominent roles. den Dekker definitely seems like a guy who may get squeezed to the minors, especially if the team acquires a veteran OF this off-season. If you want to read more of my rants on Turner‘s call-up, you can certainly find them in the comments sections over the past few months. In fact, here’s my complaint the day they called him up in this space. 45 days of service time blown so he could collect MLB meal money for a month’s worth of pinch hitting and pinch running appearances while the team flushed away its season. He started the last 6 games of the season, having only gotten two spot starts in the previous 5 weeks, in an idiotic use of his time for a team that didn’t need or use him down the stretch. By my calculations, in order to “save” another year of his time, he’d have to start in Syracuse and stay down there for *8 weeks*; 6 weeks to make up for the 45 days of service time and then another two weeks to make sure that the team saves the difference between a full service time year (172 days) and the number of actual days in a MLB season (roughly 183 days). See that happening? I don’t either. So its a moot point and we have lost any shot of extending his stay here an extra year. The Nats did themselves no favors by letting Davis hang on the active roster all year in 2014, accruing a full year of service time instead of burning an option. Perhaps in the end it won’t matter; despite all the other RH relievers used last year, Davis never got called up and seems closer to an outright than worrying about where to rent in DC for the summer. Speaking of RH relievers, the team called up Abel de los Santos in July, let him play for exactly 6 days, then optioned him back. Davis (if he’s still around) and the two 4-A starters Jordan and Hill probably each burn their final option in 2016 and then force the team’s hand next off-season. But that’s what we’ll talk about in next year’s version of this post. In the meantime, here’s the meat of this year’s post: The four players on the Nats 40-man roster who have no Options left and thus have to either be on next year’s 25-man roster or be subjected to waivers prior to the season starting. Player Service Time post 2014 First Added to 40-man Option Years Used Options left? 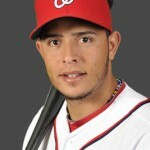 Lobaton, Jose 4.138 Nov 2008 2010,2011, unk 3rd 0 no options per mlbtraderumors; can’t tell if optioned in 2009 or 2012. Moore, Tyler 3.018 Nov 2011 2012,2013,2014 0 86 days on mlb roster in 2014; how does this add to 1.106? Now, both Lobaton and Moore are returnees from last year’s version of this post. Lobaton was always set to be Ramos’ backup and dutifully performed in that role, slashing just .199/.279/.294 in that role. I’m not entirely sure that either of the catchers on the 40-man roster can supplant Lobaton as Ramos’ backup, but I’m also not entirely sure that Lobaton will even be here in 2016 thanks to his performance. So his lack of options may not matter; if the team buys another catcher on the FA market or in trade, Lobaton is likely DFA’d soon thereafter. Moore (as noted in prior posts) has a bigger issue this coming off-season; he’s Arbitration eligible in a season where he was lucky (thanks to a constant barrage of injured players) to have lasted the whole season on the roster. As mentioned in the previous post; both of these guys are also serious non-tender candidates, which would close the book on them with this team regardless. Lets talk about the more interesting cases. Robinson, from what I can gather from his convoluted Cots contract history page, had three straight options burned after getting added in Nov 2010 by his original signing club Kansas City. After two option years and a scant four PAs in 2012, he was DFA’d and acquired by Pittsburgh, who then DFA’d him themselves at the end of Spring Training 2013. Toronto claimed him, optioned him, then DFA’d and outrighted him a couple months later without ever appearing for their big club. He signed as a MLFA with Los Angeles in 2014, got called up, got 9 ABs and then was DFA’d again (because of course by this time he was out of options…). He played out the string for the Dodgers’ AAA club and then signed with Washington as a MLFA again in 2015. So, all of that leading to his nice 2015 season for us and for 2016 he’s either going to be with us or against us: no options means he either makes the team or possibly moves on. 3/16/15: Optioned officially to AAA though the minor league season doesn’t start until 4/9/15. 4/16/15. So that’s roughly 10 days in the minors since the Nats season starts on 4/6/15. 6/1/15: recalled again; so he was in Syracuse a grand total of 10 additional days. So, by my count that’s 20 days in the minors right on the nose. But the rules say that if you spend at least 20 days in the minors, that you’ve burned an option for that year. So this is pretty close; did Rivero use an option for 2015 or not? I think he did. Now, it may not really matter since he really showed some serious cheese for the Nats this year and seems like a lock to be in the 2016 pen, but from an organizational flexibility perspective its nice to have. So there’s the Options analysis for the team (well, at least the state of the team and its 40-man roster just after the Rule-5 protection additions and prior to any wheeling-and-dealing this coming off-season). No big decisions to be had, but some concern areas for this year and next. Feel free to comment if you think i’ve gotten anything wrong in the analysis. Blevin Acquired; who is getting DFA’d? The unexpected happened today: the Nats acquired a loogy. Even more unexpected; Mike Rizzo and Billy Beane teamed up to consummate a trade (this is the 7th trade between the clubs in just the last 3 seasons). 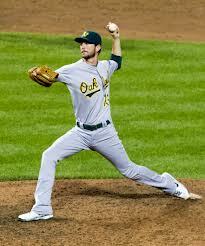 Welcome Jerry Blevins; you’re arrival has been widely speculated upon. Heading the other way is the Nats 2013 minor league hitter of the year Billy Burns, a non-prospect in the eyes of analysts but certainly a favorite of many who follow the Nats farm systems. I liked Burns, but in all honestly he’s so far down our current OF depth chart that he clearly was an expendible resource, despite his potential. I’m somewhat ambivalent on Blevins: his 2013 splits against lefties were, frankly, not impressive (a .740 OPS). It could be a one-season deviation though, since his career splits are much better (.224 BAA). He’s a lefty in the pen who mostly pitched in lower-leverage situations for Oakland this year, leaving the higher leverage situations to the better lefty in Oakland’s pen, UVA’s own Sean Doolittle. So, we gave up a lesser prospect to get a lesser reliever. Now for the fun part: We were at 39/40 on the 40-man roster with the Doug Fister trade. Nate McLouth makes 40. Blevins makes 41. Somebody’s getting DFA’d, likely today. Who makes way? The obvious candidate is Corey Brown. Brown’s chances of making the 2014 team took a severe hit with the McLouth signing. More importantly; Brown no longer has any minor league options and he would likely have been DFA’d at the end of next spring training anyway. Designating him now is the right thing to do for him by the organization, cutting him loose now to try to catch on with the best possible organization that will give him a shot at getting back to the major leagues. Summary; expected move #3 of 4 this off-season has occurred (#1 being another starter, #2 being some bench help). Last move John Buck? I took a moment to update my own little internal spreadsheet that tracks Player Options for the Nationals, now that Cots’ site has updated service time numbers for 2013. This spreadsheet is in Google Docs at this link, as well as being in the “NatsArm Creations list along the right hand side of the blog. Springfieldfan also maintains an options page on the Big Board with a bit more detail for other players in our system outside of the 40-man players that i’ve focused on. First and foremost, 40-man member Corey Brown exhaused his 3rd and last option in 2013. Does anyone think he’s going to be on next year’s 25-man roster as a bench player? Ironically the team needs lefty power off the bench, and Brown is a lefty with two straight power-filled seasons in AAA. But somehow me-thinks he’s going to lose out on this competition and faces a DFA sometime between now and April 1st 2014. He’s cleared waivers before and stayed in the organization, but with more teams purposely tanking right now I wonder if he’ll survive another exposure to waivers. A reminder that Ross Detwiler remains out of options, though the Nats have shown that limitation is easily worked around by virtue of “soft tissue” D/L trips as needed. Nonetheless, if Detwiler is healthy in spring training, he’s either your 5th starter, a lefty in the pen, or facing a transaction. It seems like we have this conversation every spring. Denard Span has achieved 5 years of cumulative service time, meaning he can refuse an option to the minors. Not that he’s in grave jeopardy of such a thing. The bulk of the team remains very options-flexible, with 30 of the 39 guys on the current 40-man roster capable of being sent down if needed. This proved to be very handy last year when a number of guys under-performed, and may prove to be handy this year. Frankly, Spring Training 2015 is going to be a big options showdown for a lot of guys on this team; I count at least four guys and perhaps more who are almost guaranteed to use their last options in 2014. But this is a topic for a post a year from now. 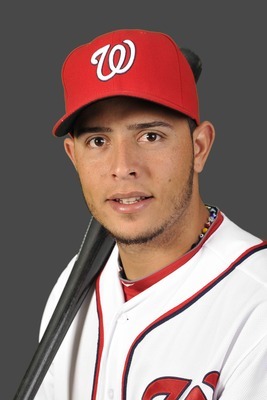 Great news 3/25/13: the Nats exposed Carlos Rivero to waivers, got no takers and he was outrighted to AAA Syracuse over the weekend. I know he didn’t have the greatest numbers this spring (8-for-47 for a meager .170 BA), but he seems like he could be a valuable utility guy in a pinch, able to play multiple positions both in the infield and outfield. I liked what I saw from him in limited TV time this spring. I’m glad he made it through waivers and remains an option in our farm system for at least this year. He also clears a spot off the 40 man, leaving us sitting at 38/40. Plenty of room to make moves if need be. But not a ton of manuverability; of the 38 guys remaining, you can only really make a case for Corey Brown as being relatively expendible/likely to pass through waivers. If we get a slew of injuries like last season that cause us to do mass call-ups, we may have to heavily depend on the 60-day DL. Meanwhile, another year of Rule-5 complaining (see here and here) has essentially proven once again to be wasted breath; both Jeff Kobernus and Danny Rosenbaum have been returned to the team. Kobernus still seemingly sits behind Steve Lombardozzi, Anthony Rendon and Wil Rhymes on the team’s 2nd base depth chart, meaning we’d have to have a pretty bad slate of injuries for him to sniff the majors this year. But, it is nice to have him back, considering his draft pedigree and bonus money investment. Rosenbaum was our AA Ace last year and started out with ace-like stuff, but struggled in the 2nd half. Given that the team suddenly has a slew of starter arms in AAA (especially if Chris Young sticks around, though he probably walks), perhaps we’ll see Rosenbaum starting in AA again. Not likely though; would you rather challenge Rosenbaum in AAA or give another year of starts to someone like Tanner Roark at this point? We’re getting closer to Opening Day! 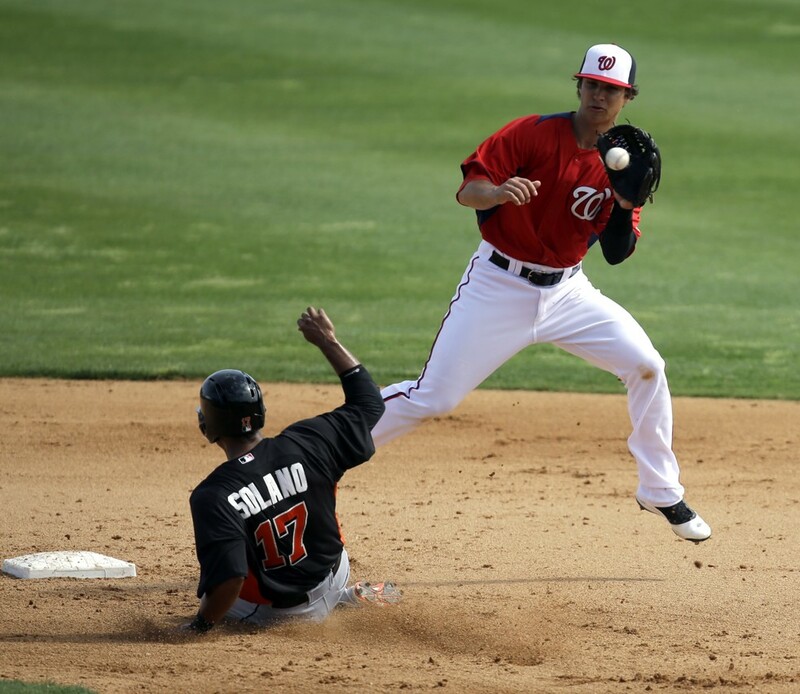 Bill Ladson publishes what may be his last spring training mailbag late friday 3/22/13. As always, I sometimes edit questions for clarity and answer here before reading Ladson’s response. Q: Micah Owings is showing pretty impressive numbers in Spring Training. What are his chances of making the Opening Day roster, considering Roger Bernadina and Tyler Moore are also backup outfielders? A: Zero, barring an injury this week. The Nats outfield has been set since mid last year. Micah Owings knows this but took the offer with the Nats presumably for two reasons: the team is expected to be good (and what veteran player doesn’t want to catch on with a first place team?) and the team is a bit thin on corner outfielder OF prospects in the higher minors. Looking at the current state of the minor league depth chart, it isn’t hard to see how a solid start in AAA would catapult Owings above Corey Brown into the #1 OF reserve spot (of course, Brown can play center, so it would likely depend on which OF was injured, but still). I like reclamation projects, and I like what we’ve seen out of Owings so far this spring. I’d like to see him make it back to the majors as a big bopper. Ladson agrees, though he says the team may promote him in May or June?? Who exactly is he to replace? Q: Most of the Nationals’ starters are not showing good numbers in Spring Training. Should we be worried? A: Nope. Rule number one with Spring Training; pay zero attention to the stats of any established Major Leaguer. They’re not pitching these games to try to get a win; they’re pitching to get ready for the season, to work on specific pitches, to work on location, etc. I once heard a story about Tom Glavine giving up something ridiculous like 8 runs in his final spring training outing and the press corps going nuts; turns out he was working on locating his change-up, and ONLY working on locating his change-up, so once the opposing team figured out what he was doing they started sitting on an outside change-up and tattooed him. This is exactly why you can’t trust stats from Florida. Ladson agrees. Q: Do you think the bars that Bryce Harper and Stephen Strasburg have set for themselves this year will be too much for them to handle? A: I’m not really aware of any “bars” either player has set; the only things I can think of are Strasburg saying he wants to be a “workhorse” and perhaps Harper saying he wants to hit 30 homers? It isn’t like they’ve thrown down the gauntlet and said they want to win MVPs, Cy Youngs, etc. Now the Press on the other hand; yes they’ve probably set the bar too high. 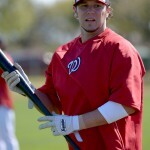 But (especially with Harper) it isn’t hard to see this scenario; usually MVPs are the best players from the best teams. If the Nats end up being a playoff team, and Harper is our best player …. he’s going to be a leading MVP candidate. This doesn’t imply Harper is the best player in the league (that’s NOT the definition of the MVP and not how its generally voted), but it does mean he may be in the running. Ladson dismissed the question as well. Q: What do you feel are the plans with Eury Perez this season and beyond? A: First off, I’d say that Eury Perez really cost himself development time this year as a side-effect of playing for the Dominican Republic in the World Baseball Classic. The Nats demoted him while he was sitting on the bench for the D.R., and mentioned publically they were worried about his lack of work. I’d say that Perez needs another season proving himself at AAA before he really starts putting himself in the mix for a full time MLB spot. He put up great numbers last year; .314/.344/.361 between AA and AAA with 51 steals in 127 games. That’s classic leadoff/centerfielder stuff, or exactly what the team acquired in the off-season in Denard Span. In games so far this spring, Perez has just glided to 2nd base on steal attempts; he’s faster than nearly any player I can remember in a Nats uniform. 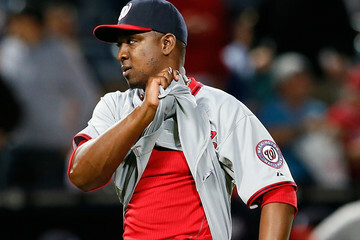 But the question is this; how does Perez fit in given that the Nats are committed to Span for at least 2013 and 2014 (it seems more and more likely we’ll be declining his 2015 option based on this paragraph), and considering that the team has rising stud Brian Goodwin who seems to be a similar player in a similar position (albeit with slightly less speed but significantly more power)? I’m beginning to think that the log-jam in the Nats outfield is going to eventually mean that Perez ends up being traded for an opportunity elsewhere. Ladson agrees with all of these points, also mentioning prospect Michael Taylor, who I always forget about. Wow; short mailbag, only 4 questions. It’s been a while since Bill Ladson did an inbox; strange because you’d think with Spring Training in full swing he’d be getting a ton of emails. Here’s his 3/14/13 edition. Lets see if he takes a question on who will be the 2014 manager for the 5th consecutive time. As always, I write my own answers before reading his, and edit questions for clarity as needed. Q: Should the Nats be worried about sending their pitchers to the World Baseball Classic? Will there be pressure on them to pitch too many innings too soon? A: Yes, this organization may be worried, as discussed in depth in Feburary in this space. We’ve never had a pitcher throw in the WBC who hasn’t come back either injured or less effective, and league-wide studies show the same trend. 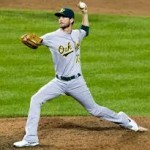 However I will say this: all 5 pitchers we’ve sent in years past were relievers. This year we sent two starters in Gio Gonzalez and Ross Detwiler. So maybe things will be different. Yes the concern basically is that these guys are more interested in getting outs than getting ready for the regular season, causing them to overthrow, to not prepare as they normally would in the spring, to not focus on specific things that they would normally do in spring training games. It is less about innings or pitch counts (which are strictly monitored). Ladson says the team isn’t worried about their arms, but is worried about the lack of playing time Eury Perez is getting. And they have a great point; Perez is sitting on the DR bench instead of getting ABs in spring training games. His chances of making the team dropped to zilch and he’s already been re-assigned to AAA. 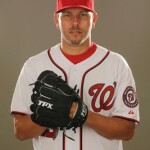 Q: Who are going to be the lefties for the Nationals by Opening Day? A: I’m assuming he means the “Lefty relievers.” At this point its looking like we’re going to break camp with just one lefty reliever in Zach Duke. Bill Bray needs more minor league time, Bobby Bramhall and Sean West are in minor league camp slated for AAA jobs, Brandon Mann got one inning and was awful, Pat McCoy got some innings but isn’t ready. Only Fernando Abad has stuck with the big-league team and looks good. But, if Henry Rodriguez is ready to go there’s no room for Abad. I’m guessing Abad goes to AAA and bides his time. Ladson agrees, and points out that our righties can get lefties out. Q: With Tyler Moore on the big league roster, what do you think will happen to Chris Marrero? A: I’m going to answer this my way, then i’ll predict what Ladson says. Chris Marrero goes back to AAA, burns his last option in the process, and bides his time waiting for injuries to take out the likes of Adam LaRoche and/or Tyler Moore. That seems to be the only way he gets opportunities this year. The team will hope for a strong AAA season to build up trade value and then will move him if they can. Otherwise he’s looking at a waiver wire trip this coming off-season. Now, before I read Ladson’s answer i’m going to guess that he says something along the lines of “The Nats will look to trade him for valuable assets” but he’ll neglect to mention that Marrero has zero trade value right now, having missed all of last year. Lets see if i’m right: I stand corrected; Ladson has finally come around on his stance on Marrero and says he’ll be in AAA all year. Q: Would the Nats ever consider adding Kyle Lohse to the roster? A: Consider? Perhaps. Actually do it? I don’t see it. Kyle Lohse is becoming the poster child for the problem with the Qualifying Offer in the new CBA. He foolishly declined it (on the advice of Scott Boras, who probably told him he could get 3-4 years guaranteed on the open market), and now sits unsigned 3 weeks from opening day. Its amazing; this guy was 16-3 last year! Lohse is seen as a product of his environment, a great coaching staff in St. Louis who do wonders with mediocre pitchers. And make no mistake; 2012 aside Lohse is a career 97 ERA+ pitcher with a .500 record and a 4.45 ERA. He doesn’t fit into the mold of what Mike Rizzo generally wants in a starter; power arm, high K/9 capabilities. Now, if the team bus crashed and we lost our starting rotation to injury tomorrow … yeah i’m guessing we’d give him a call. But there’s no way the Nats (or likely any other team) is going to give 3 guaranteed years to a 34-year old soft-tossing guy. Boras really, really miscalculated here and it looks like its going to cost his client millions. Ladson agrees. Q: Please find out where Cole Kimball is in his rehab. I would like to know if he’s anywhere close to pre-surgery velocity. A: I only saw Cole Kimball in one game, but his velocity was down. Perhaps its ramped back up later into spring training. In either case he’s bound for AAA to burn his last Option and await bullpen issues for his shot. Ladson says he’s “close to throwing 95-mph.” I wish more of these games were televised. Q: Having heard earlier in the offseason that general manager Mike Rizzo feels Steve Lombardozzi and Danny Espinosa are both starters and not bench players, do you feel one of them will be traded prior to Opening Day? Lombardozzi was an extremely clutch pinch-hitter last year in my opinion. A: Traded prior to Opening Day? Almost impossible; nobody makes trades at this point in the season. You make trades prior to spring training and then after a couple months are past in the season to address off-season or intra-season needs. We’ll save the Espinosa vs Lombardozzi vs Rendon discussion; we all know it by heart by now. Ladson says a trade is not coming. Q: Considering he had a very good year with Triple-A Syracuse in 2012, what are the chances of outfielder Corey Brown making the team? A: Zilch. He may have hit in AAA, but he didn’t hit squat with Washington last September. 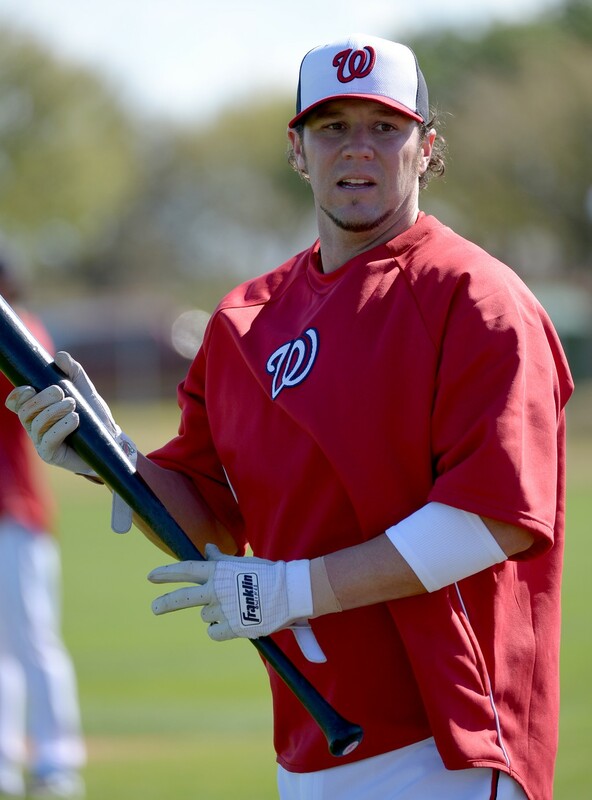 He’s at least 6th on the Washington OF depth chart (Werth, Harper, Span, Moore, Bernadina and then Eury Perez. Perhaps even lower; I think the team would give Carlos Rivero and Erik Komatsu chances before Brown at this point. And its just a matter of time before uber-prospect Brian Goodwin passes him by as well. Brown’s looking at another year of AAA time, burning his last option, and then getting the MLFA treatment. Ladson says no chance. Hey! 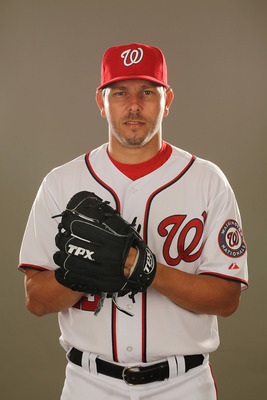 No question on the 2014 Nats manager this time! I stand corrected.